For those who love vegetarian foods, this one’s a treat. Made purely out of veggies, I am sure you will love the flavor of this simple yet delicious recipe. Finely chop the carrots and potatoes and boil them both separately. Boil peas too. Take a dish and add lemon juice, sugar, salt and black pepper and add 3 tbsp mayonnaise. Put in all the vegetables and mushrooms and mix them. 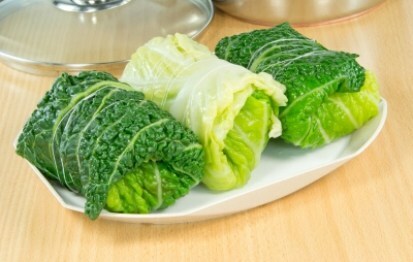 Dip the cabbage leaves in boiled water and drain them. Make a roll of each leaf by filling them with the vegetable mixture just made. Take two tomato slices, place them on the roll and tie it with stems of spring onions. Rolls are ready to be served.